I will spare you the play by play of how my tiny boy spent his first day away from us. And you know that I know how he spent his day, down to what he did and did not eat. He's going to sleep hard, and my mom who played with him non-stop will sleep even harder. How did we spend our evening, you ask? Working late. And then snow cones. Parents gone wild, that's what it is. I know that it's not unique to have memories of the snow cone stand of your childhood, but I just have to tell you that my hometown has the best snow cone stand I've ever visited. Even Mr. G agrees, and he's not from there so I feel as though he is terribly fair and impartial in this matter. 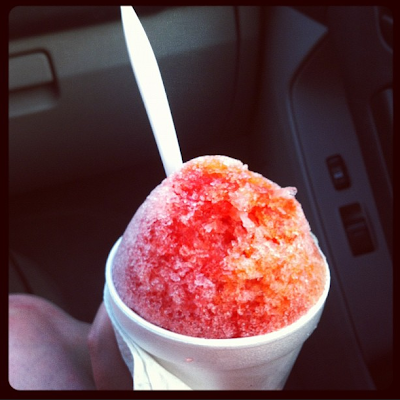 It's called Sno-Biz. The ice is shaved to perfection, they serve it flat top style in a bigger cup so you don't lose any of it (those smarties at Sno-Biz! ), and the juice is rich and delicious. My favorite order there is called a sunset, and it consists of strawberry, cherry, and orange. A perfect sunset. That's what I order every where else I go too, but no other snow cone stand calls it by its more poetic name. Sad story, but it's totally true. Scientific testing has proven that sunsets are more delicious. Other stands are missing out. The lesser snow cone I had last night. I'm praising God, the Creator of this Monday, for that unexpected turn. 3 more days 'til I pick up my boy. We just called them "shaved ices" in Alabama. (Snow cones were always made of harder, crunchier ice there.) But we've had trouble finding them here! The place we went a couple of summers ago closed, so we'll be on the lookout for a new one this year. I think y'all are further south than us, but the best shaved ice/snow cones we've found in FW is on West Camp Bowie across the Taco Bueno (8601 West Camp Bowie.) If you get bored some evening, you ought to check it out! So, I know I just discovered your blog recently, but I already love it! I just nominated you for a Liebster blog award, which is to recognize bloggers that inspire you. The details are on my post from today, which I think you'll get if you follow me, but just in case, here is the link... http://thestimsonchronicles.com/2012/06/06/id-like-to-thank-the-academy/ Thanks for writing your blog!